Boxers entered into conformation events are judged on how closely they represent the breed standard. 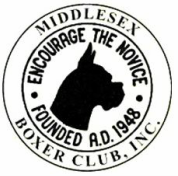 Winning Boxers are awarded points depending on the number of dogs they beat in the ring. To become a champion a Boxer must earn 15 points. Owners may elect to continue in conformation competition by competing for a grand championship. Use this link for more information on AKC conformation events.